It is 3pm on the 25th of January and I am calling you from 18,300ft/5,578m at the Nest of the Condo – Nido de Condor. 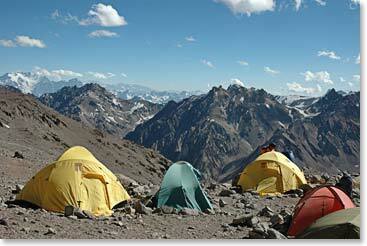 This will be our Camp II. Osvaldo and his team established a cache a few days ago and today we’ve added more equipment, food and personal gear to our cache of supplies which will support our summit climb from Camp II here. It is beautiful here. 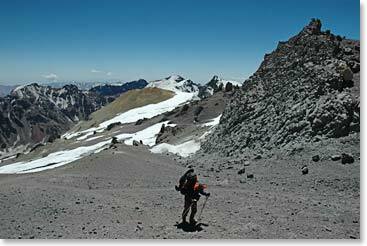 I can look up and see the summit of Aconcagua and it is still very far from us. It beacons us from above. The views from Plaza Canada are spectacular. We had a fantastic breakfast today. Maria made pancakes. Being a Canadian team, we brought lots of maple syrup from home. I watched the entire team eat one pancake after another and the pancakes were drowned in maple syrup. You could hardly see some of their pancakes. It was certainly a high energy and nutritious breakfast for our team. We made it to Nido de Condor from Plaza Canada in only 3 hours. We are going to drink some tea and eat a snack. Then we will put some things away in case the wind blows hard, which it often does here. Once we’ve done that, we will descend back to Plaza Canada for our second night there. Note from the Office: Just an hour after we received the dispatch from Wally, he called again to say that they had made it back to Plaza Canada. It took them 3 hours to climb up and only 45 to climb back down. Everyone is doing great! 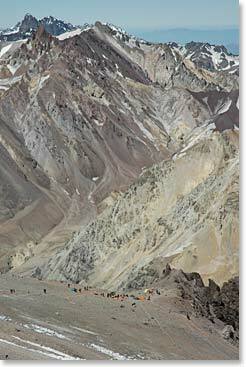 Climbing to Camp II, Nido de Condor – the Nest of the Condor. Returning to Plaza Canada for another night.